Final Fantasy XIV‘s Hatching-tide seasonal event returns Tuesday, April 9th and will include limited-time glamours and seasonal items. For items offered in previous years, Square Enix has made them available for purchase on the MogStation. You can find the quest chain to start the event below. Posted in Final Fantasy XIV. When will they do a FF7 event ? With the data scape with Omega not once was there a FF7. I don’t care about minions or frills or clothes that just for glamour . I care about Story and no comedy or playing around. And it’s still a long as wait till Shadow bringer. That’s because FFVII is obviously being saved for something else. Yoshi has already made it clear at the launch of the of LR event at the start of 2.0 that Cloud and Sephiroth will not just come out of no where, they need a reason. Fairly evident they haven’t come up with that reason yet, also a majority of the game is already just FFVII galore, look at the limit breaks, story elements, and enemies. This is due to Yoshi being a VII fanboy, I say that will all do respect, as I too am a VII fan. The Omega dungeons were meant to obviously soothe a lot of other fan demands that are outside of FFVII, mainly due to Final Fantasy V and VI being semi-popular titles in Japan and Western players respectively. Also these seasonal events are always common at this time, so get used to it. They have already accepted that people consider the glamour scene an important one in the FFXIV community. Listen to Brian and Koji during the casts for XIV, glamour is the real end game. I do admit the events get stale though after the first time you do them though. I just skip the cutscenes now and just get the glamour for my little lala, then move on. But if time can be spent on seasonal stuff and clothes that serve no purpose other than “hey I did this event look at me”; couldn’t time be spent adding optional dungeons and more side quests that add lore? I mean Hildebrand is all comedy and can be funny and annoying in equal shares and even it gives more lore. If FF7 is on the backburner fine. I’d say at least give me something seasonal to do other than a lighthearted quest. Why not make all seasonal event connected by a story line and recurring characters. Why not make it so each seasonal event has to do with an iconic NPCs’ history? Anything other than just nonsense that is just meant to kill and hour of your time and nothing more. After doing their stuff they have there with 12 and FFT my mind is blown. They added Ivalice to the world like another story or game. Fran. Ghosts of people from FFT. Resurrection of Mont blanc. It’s madness. What does this mean for Ivalice games. Are they gone forever and will live on in 14? Ba’gammon was there and died there. 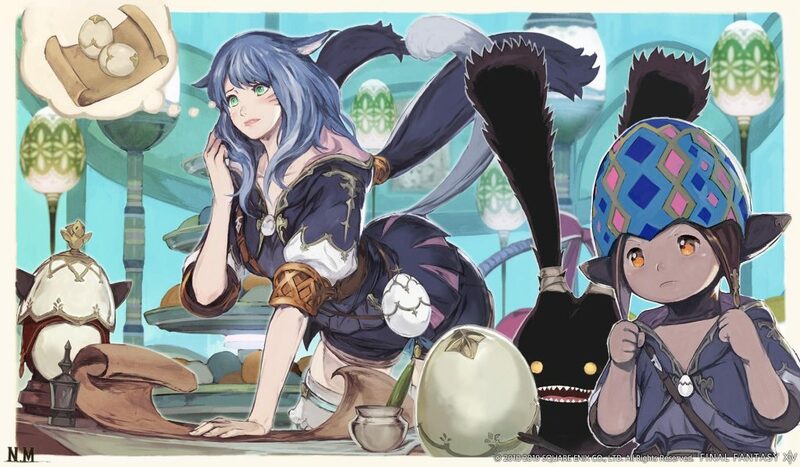 I can’t tell if it’s an alternate dimension or this is canon since there won’t be anymore games connected to ivalice. The Ivalice in XIV is not the same, it just so happens to be very similar. Plenty of people care about seasonal events, myself included. They’re fun to do and offer glamour that people like to wear. This game has many aspects to it, and not catered to one mindset. We’re not going to get random dungeons now, the content for 4.X is over. Seasonal quests are supposed to be lighthearted because that’s the point of them existing. It’s fun to just do something that isn’t based on the lore in the game, and to just have fun. Remember, this is a game after all. If you’re not interested in doing them, just don’t do them. Unsub to the game and play something else until the expansion. However, this game isn’t going to always please everyone at once. So will there be any more ivalice games? I’m not talking about random dungeon. I’m talking about lore and dungeons that go with that lore. You purposely over simplified what I said to discredit it. What does glamour serve in the grand scheme of things? Okay you got clothes. And you make your character stand out showing it off. Now what? What’s next? Answer: nothing. All you can do is wait for another event for more clothes. What lore and dungeons do is build on the story and all the while giving you battles. I play RPGs for story. Clothes are good but that’s an afterthought. I can find functional armor or clothes that also looks cool. I don’t need an event for that. It’s possible, I don’t see why not. It’s a holiday event, it’s not supposed to add story content to the game. Plus, it does have it’s own little lighthearted storyline. Are you going to complain at Christmas time because there’s no lore in your presents? I care very much about the lore and story in this game, but not every piece of content needs to be lore based. Again, this content is supposed to be fun. So you play a game with a story but focus on glamour ? Well that’s that. I’m done. Let’s agree to disagree. After years of people saying games are mindless people have begun to ignore it even when they put serious thought into thought provoking story. Look how long ago war of lions was and 12. I haven’t seen anything for either in a decade. How is a holiday event “focus on glamour”. No, I don’t focus on glamour. Right now I’m focusing on raiding in the game. The holiday even takes an hour or so to do in one day. Raiding takes days and days of practice and coordination with others. You’re not reading what I’m saying. Why don’t you care about the story in a role playing game? The genre where story matters most and usually is a focus for the devs making it.